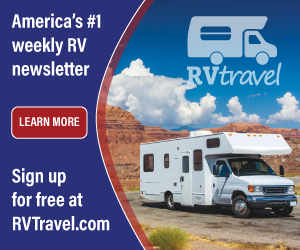 My RV roof leaks in several places and the roof sagged around the air conditioner. While surveying the damage I determined that the roof is constructed in layers including rubber material, plywood and foam. The air conditioner mounts to a 2' x 6' piece of plywood that is supported only on one end; like a diving board. I think I need to replace all but the foam and some of the rafters. Can you offer advice on the best way to proceed for a do-it-yourselfer? Roy, extensive damage from water leaks usually mandates a complete roof replacement; a major repair best left to the professionals. Here's a typical process when performed in the shop. First, every component from the entire roof area, A/C, all vents, antenna, running lights, storage pods, racks, ladders, etc., must be removed. All the side trim, awning rail, drip molding, etc., will also have to be carefully removed. 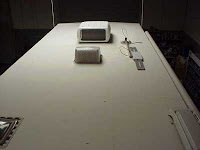 Typically the rubber membrane is cemented to the plywood substrate and folded over the sides of the RV and stapled prior to the trim pieces being attached. At the front and back there may be a flat molding strip or the membrane might simply tuck under a fiberglass cap. 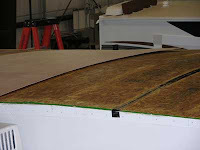 All of the rubber membrane must be removed and the damaged plywood sections located. In some cases, the water may have permeated the foam insulation and possibly the interior ceiling paneling. All damaged insulation and interior pieces will also be replaced when necessary. All damaged or warped wood rafters will be replaced with new. The technicians should gradually taper the rafters to the ends so that they are thicker in the center. In other words, it create a slightly crowned roof. This will eliminate low areas and ensure proper water drainage, especially at that sunken air conditioner location. Once all the new insulation and rafters are secured, the entire roof is covered with new plywood. In some cases I recommend 3/8-inch plywood, though 1/4-inch will usually suffice. Extra care is taken to make sure the seams between the panels are very tight. There should be no screws or staples sticking up above the level of the plywood. The seams must remain flush and smooth so the EPDM rubber will not tear or crease during installation. Additionally, the good installers bevel the edges of the plywood slightly at the sides of the roof. This whole preparation stage is crucial! If the cement used is a bonding-type, such as contact cement, it must be applied to the bottom ply of the EPDM as well as the plywood substrate. When a water based adhesive or pressure sensitive cement is used, it is applied only to the plywood. The EPDM membrane should be long enough so it can be rolled out the entire length of the RV. It should also extend over the sides of the RV; enough to fold down behind the drip molding or awning rail. Typically, installers fold back the membrane front to rear about halfway and apply the cement by brush, roller or spray gun. If a solvent-based contact cement is employed, it is applied to both the substrate and the membrane and allowed to dry. If they use a water-based, pressure sensitive adhesive, it is applied to the membrane while the cement is still wet. They then will roll out all air pockets from the centerline of the coach to the sides with a lightweight roller or a push-type broom. At the RV sides, the material is folded over the edge of the roof and stapled to the sidewall on top of the siding material. Butyl tape or caulking is applied to the back of a drip channel or awning rail prior to reinstalling it to the sides of the RV. Excess material hanging below the molding or rail is simply trimmed off with a razor knife. After the roof is completely cemented in place and secured around the perimeter, all the openings for the sewer vents, the refrigerator vent, the 14-inch vents, the roof air conditioner opening etc., are cut with a sharp pair of scissors. They should always radius the corners to eliminate the possibility of the EPDM tearing. If possible, excess rubber is folded into the opening and stapled to the sides of the opening. Butyl tape is applied and the vents are installed as usual and all screws, flanges and edges are sealed with Eternabond tape. The pro shops will then leak test the entire roof to be sure there is no possibility of water intrusion. (See why this is typically not a D-I-Y job?) Let the pros handle a complete roof replacement.